Teeth sometimes become darker if their roots have been damaged or diseased and the nerve has died. Tooth colour can be very effectively lightened using tooth whitening gel, used inside or outside the tooth. Tooth whitening is completely safe. Where the nerve of the tooth has died and the tooth’s root has been filled, bleach is put inside the tooth, under a temporary dressing. The bleaching agent remains in the tooth for about a week, before being cleaned out so that a white filling can be placed. There are two ways of whitening outside the teeth. One takes place at home and the other in the dental surgery. 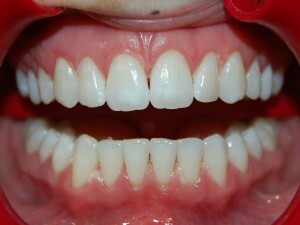 The dentist will give you a whitening gel to use at home in a tray which fits closely round your teeth. You will need to put the tray in your mouth for a few hours for 14 consecutive days/nights, as instructed by your dentist. The dentist will use a putty like material to make moulds of your mouth (Called impressions) so a dental technician can make the tray to fit. At your next appointment, your dentist will check the tray fits and show you how to put the gel in the trays at home. Your dentist will use a stronger gel than is used for home whitening. 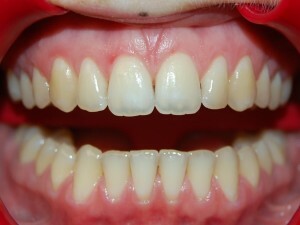 The stronger whitening gel will be applied for two 2omintue sessions. The gel will then be washed off with water. Your dentist will make a note of your tooth colour using model teeth in different shades before they treat you. Your teeth may be sensitive during treatment, this is however transient and will go a few days after whitening. Whitening improves the appearance of your teeth without removing any of the natural tooth surfaces.